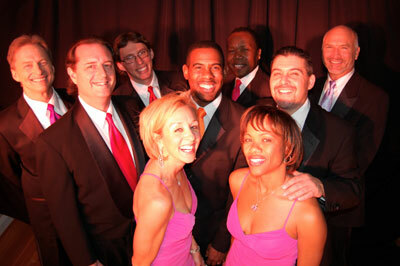 NightLife is a high-energy band that will liven up any occasion. NightLife's most largely received compliment is, "you all look like you are having so much fun!" And we are! We offer the perfect mix of excellent entertainers to keep the crowd on the dance floor, and an extensive song list which allows us to tailor each event to the musical preferences of each individual client. Every year since 2009, we have earned the “Best of Entertainment” award from Wedding Wire, The Knot and Washingtonian’s Bride and Groom Magazine. Our performances have consistently received 5 out of 5 star reviews from clients. That is a 100% satisfaction rate from our client base and many have said they wished they could rate NightLife even higher. Whether our clients are looking for Top 40 hits of today or classics from Frank Sinatra and Louis Armstrong, or songs that represent where you grew up (Sinatra, Springsteen, Bon Jovi, Jersey Boys) or where you went to college, NightLife performs music from all musical genres. We are open to requests to learn new songs to make sure your favorite tunes are part of your special occasion. With more than 20 years of experience, NightLife has performed at hundreds of corporate events, weddings and special occasion parties, as well as Bar and Bat Mitzvahs and many fundraiser galas. Mainly performing around Maryland and Washington D.C., we have also traveled along the East Coast and Internationally. Our band features a choreographed front line including two female and two male lead vocalists. Our backing band boasts four members on keyboards, drums, congas, electric guitar and the saxophone.